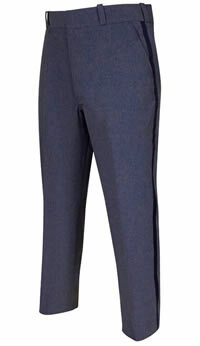 Regular Fit Postal Certified USPS Letter Carrier Trousers. Extra Wide Snugtex waistband on all trousers. Just wash 'em and wear 'em. 100% Polyester. Machine washable 9-oz. Lightweight Tropical. Excellent shape and crease retention. Tex and Ban-Rol waistband to prevent shirt pull-out and waistband rollover.